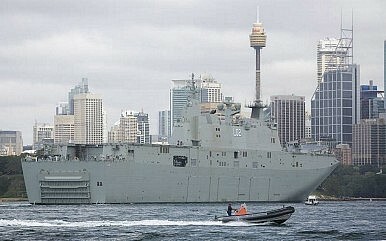 Australia’s new Landing-Helicopter Dock (LHD) amphibious ships will be a game changer for its ability to project force. In mid-1987, troops from the Australian Army’s Operational Deployment Force stood off shore from Fiji spread amongst the warships HMAS Parramatta and HMAS Sydney; the supply ship, HMAS Success; and the Royal Australian Navy’s one and only amphibious ship, HMAS Tobruk. These troops were there as part of the Australian government’s response to the May 1987 Fiji coup by elements of the Royal Fiji Military Forces, led by Lieutenant Colonel Sitiveni Rabuka. At the time, the ADF had been structured around the Defense of Australia (DoA). DoA focused on concentrating air and sea power to defend the air-sea gap to Australia’s north. This sea denial strategy placed little emphasis on the ability to project force in Australia’s near region and left Australian policymakers with precious few options in the region when events such as the military coup in Fiji occurred. Operation Morris Dance was, however, the starting point of the development of the modern day ADF amphibious capability. A development that took its greatest leap into the future with the arrival of the first of two new 27,000 ton Landing-Helicopter Dock (LHD) amphibious ships in its new home port of Sydney on March 13 of this year. For an island continent located in the broad sweeping geopolitical arc of the Indo-Pacific, it would be easy to assume that amphibious operations have played a central role in Australia’s military history. However, through a combination of geography and a preference for strategic alliances with the dominant Anglo-Saxon naval power in the Pacific region, Australian defense policy has largely been beset by a bipolar division of strategy between the DoA and a mainly land power-centric expeditionary school of strategic thought. Now with the global strategic center of gravity moving to the Asia-Pacific, Australia is developing a “third way” in strategic thought, epitomized by the emergence of an Australian maritime strategy. A robust amphibious capability will play a prominent role in this new maritime strategy, and it was the lessons of Operation Morris Dance off Fiji in 1987 that kicked off a slow and steady evolution in amphibious operations for the ADF. The first stage of this was the decision in the early 1990s to acquire two surplus U.S. Navy Newport-class 8,500-ton tank landing ships, redesignated as “Landing Platforms Amphibious” (LPA). However, the Newport-class vessels caused excruciating problems for the ADF. Their conversion from their original design to an LPA required major changes to the vessels and during the conversion process extension corrosion was discovered during the refit. This and other problems led to cost overruns and delayed their entry into service until the end of the decade. The delay into service of these ships was felt most profoundly in 1999 when the Australian government decided to intervene to help stabilize the deteriorating situation in East Timor. The United Nations INTERFET operation in East Timor, led by Australia, found the ADF woefully understrength in amphibious craft. The RAN had to battle on with only the indefatigable HMAS Tobruk (long overdue for maintenance), a recently leased fast catamaran, HMAS Jervis Bay, and three heavy landing craft. Despite being small in number, the RAN’s amphibious forces were critical to the success of INTERFET and its commander, General Peter Cosgrove, who would go on to state that these amphibious assets were a “capability of first resort.” Just over a decade on from Morris Dance, INTERFET served to reinforce not only the potential requirement for the ADF to conduct amphibious operations but also the stark lack of a modern capability that it possessed. These deficiencies were particularly glaring once the U.S. Navy’s amphibious assault ship, USS Belleau Wood (LHA 3), started to provide support to the operation. The LPA’s HMAS Kanimbla and Manoora entered service in 2000 and subsequently contributed to operations in Iraq and Afghanistan and played a central role in the Australian response to the 2004 Indian Ocean tsunami. When used in concert with Tobruk, they formed an RAN amphibious ready group (ARG), which played the critical role of supporting the recommitment of the ADF to East Timor in the 2006. Why Australia Needs Nuclear Subs What Comes After US Hegemony?Liberal Bloodbath Repels Australian VotersJakarta and Jerusalem: Australia's Israel Embassy DecisionWhat Happened to Australia’s Liberal Party?